Scotland's recorded history begins with the Roman Empire's invasion of Britain in AD 43. After subduing the Britons in England and Wales, forces under the command of Gnaeus Julius Agricola, governor of the newly-created Roman province of Britannia, entered Scotland in 79 AD. Within four years, Agricola had conquered southern Scotland and made preparations to overtake the Caledonian tribes of the north and west. Led by their chieftain Calgacus, the Caledonians resisted the invaders, attacking Roman forts and legions. In the wake of the Battle of Mons Graupius, it must have seemed to the Caledonians that Rome would subdue the whole of Scotland. 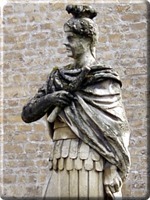 Politics, however, intervened: facing crises on the Rhine and Danube frontiers, Emperor Domitian ordered Agricola back to Rome. In 122, the Empire marked its western frontier with the construction of Hadrian's Wall between the Solway and Tyne rivers. During the century of peacetime that followed, the Caledonian tribes united to form the Pictish nation. The name "Picts" first appears in documentation in 297 AD, from the Latin Picti, or "painted people." The new nation took advantage of the empire's decline and made war, preventing Rome's full consolidation of southwestern Scotland. 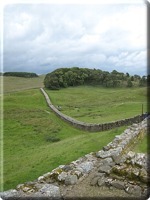 In 360 AD, they allied with Gaels from Ireland to launch a concerted attack to penetrate Hadrian's Wall. Within four years, their raids reached deep into Britannia's interior. 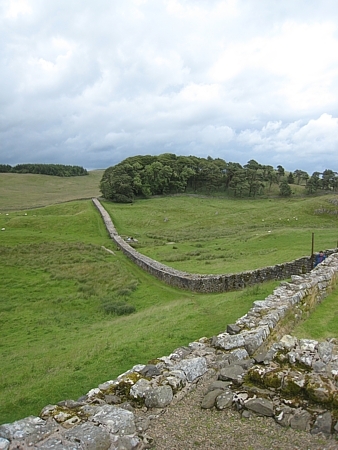 Hadrian's Wall was deserted in 411 as Roman legions departed to defend the heart of the empire from the Visigoths. Rome then hired Angles and Saxons to defend the Romano-Britains from raids by the Picts and Gaels, abandoning the British Isles altogether in 430.